Hollywood, CA, April 28, 2015 --(PR.com)-- Rabbi William Weinberg, the subject of the book Courage of the Spirit, finally gained his freedom in Vienna with the surrender of Nazi Germany to the Allies on May 9, 1945. To commemorate the 70th anniversary of this event, IndieGo Publishing is offering Norbert Weinberg's book at greatly reduced promotional prices from April 26 through May 10, 2015. The ebook will be available for 99 cents from Nook, Kobo, Google Play, and Apple's iBookstore, and for $1.99 from Kindle. Courage of the Spirit portrays the spiritual struggle of the author's father, Rabbi Dr. William Weinberg, who survived Nazi and communist tyranny to become the first State Rabbi of the community of Holocaust survivors in the German State of Hesse. Rabbi Weinberg's journey spanned thousands of physical miles by freight train and on foot, from cosmopolitan Vienna and Berlin to Stalingrad and central Asia as he and his brother Benjamin kept a step ahead of the Nazi armies. The book spans the mental and emotional journey from the medieval shtetl and the great empires to the weak democracies and totalitarian regimes that followed, and finally, to freedom. Courage of the Spirit reconstructs these events from conversations with the author's father and his uncle, from family notes, and from historical documentation. Our Torah reading of this Shabbat opened with the bizarre death of the two sons of Aaron, Nadav and Avihu just at what should be the greatest of days, the day of their dedication as priest of the new sanctuary in the desert. Moses tries to comfort his brother, ” I will be sanctified by those closest to me,” but Aaron answer is Vayidom Aharon, “Aaron kept silent.” He could give no answer and could accept no comfort. ( Leviticus 10). The fate of the martyrs of Holocaust in some ways is reminiscent of the fate of Nadav and Avihu. Let no one blame any faction of Jews for failure or lack of righteousness nor for silence or fear. Our only deep answer possible is that of Aaron, Vayidom Aharon. We are silent, like Aaron. Nevertheless, speak we must and lay the blame clearly, not at the feet of the victims, nor at the feet of God, but at the feet of the perpetrators, the bulk of the Germans and their fellow travelers of other nations who swore allegiance to Hitler or joined in the bloodshed for whatever reason. Now it is 70 years to the end of the Holocaust on May 7, 1945, marking the collapse of the Third Reich. Our own friend ,Joe Alexander, was freed at Dachau on April 29.My mother, Irene Weinberg, was liberated sometime mid-February in the Czestochowa region and sometime in April my father arrived in a liberated Vienna. I mention my father, Rabbi Dr William Weinberg. Many of you know that I recently published a book about him, Courage of the Spirit. He had served as the first State Rabbi of Hesse, the American zone around Frankfurt, Germany. I look into his writings to find hints of how and why this great human horror story unfolded. Why did the Nazis need to destroy the Jewish people. It is true that they vented their rage on homosexuals and Gypsies and were out to enslave the Slavs, but only one people so focused the mind of Hitler in his manifesto, Mein Kampf. Only one people, small and few in numbers, the Jewish people, so focused his mind. Why so? Obviously, there is the old history of Christian anti-Semitism and the accusation of Christ-killer. But, as my father wrote, not one Nazi ever accused him of being a Christ killer. He had spent two years in a Nazi prison from 1935 to 1937. His fellow inmates were political prisoners for the most part, either Communists or other Nazis! Yes, other Nazis, because Hitler needed to control those Nazis who believed too much in the cause. So for two years, he learned the inner thinking of the Nazis, up close. 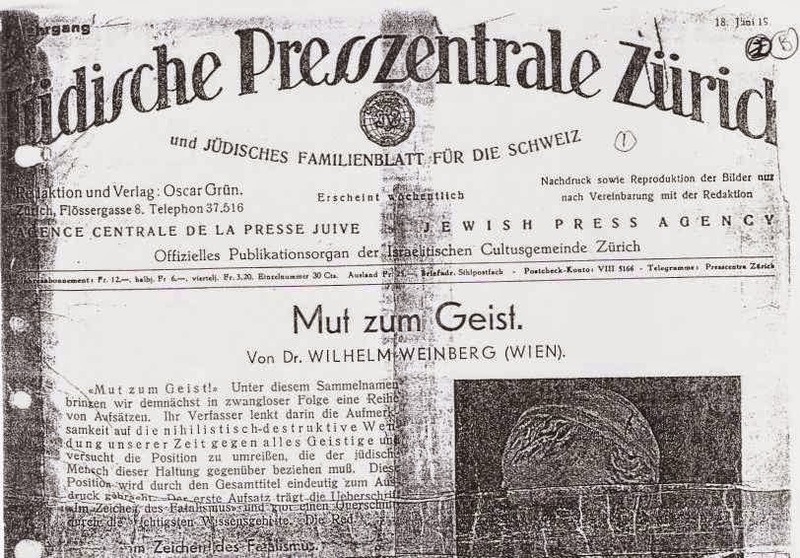 He was released in April and escaped quickly to Vienna, and while there, he wrote a series of essays that appeared in the Zurich Jewish newspaper just two months later, under the name," Courage of the Spirit". It was on the contrast between Judaism and the great ideologies of modernity: economic determinism, what we call Marxism, psychological determinism, what we call Freudianism, and biological determinism, what we could call, in parallel, Hitlerism. In other words, to cut through my translation of his flowery German prose, we as Jews believed in a common destiny for humanity, a common value, a common ethic. It is this which distinguished us from Nazism, even more so than from the other ideologies, which shared at least some sense of commonality of humanity. It is this belief that the human shares his humanity with others, that the human is “God’s partner in creation”. Now, Nietzsche was the brilliant philosopher who preached the devaluing of all values. He died in terrible insanity. The metaphor, for my father’s readers was clear. The German people had fallen into the same degenerative insanity that had befallen the great intellect. Nietzche self-destructed; so to say, the German people had self-destructed. So prophetic! Within the space of seven years, the Third Reich had plunged the entire world into a “Twilight of the Gods”, the world saw mass murder with efficiency on a scale never imagined, and the human race entered the age of nuclear weaponry. Germany was rubble. Nazism, as a movement of will and the expression of absolute power, needed to destroy the very people who brought the world their commonly accepted system of values. Christianity stood in the way, for sure, but the resistance of the Church, whether Protestant or Catholic, proved feeble and powerless to sway the bulk of the people of Germany and their fellow travelers, the collaborators among the other Europeans. No. The target had to be “The Jew”, because the Jew is at the root of Christianity. The Jew represents the father, represents obligation, responsibility, prohibition. To borrow from Freudian explanations, the son must destroy the father in order to have the mother. This underlying pathology was a greater cause of fear in Hitler’s obsessions, as of those of his followers, a greater fear than the Jew as capitalist and communist combined, or the Jew as the creature whose tentacles control the governments of the world. Buried deep in their psyche, was the Jew as the obstacle to the fulfillment of unbridled passion, power and force. For Nazism to be the “Triumph of the Will” it needed, above all, to triumph, not over the malicious American and English capitalists, not over the evil Bolsheviks, but over the Eternal Jew. All the efforts of the war would be subordinated to the annihilation of the Jew. “They will beat their swords into plowshares and their spears into pruning hooks. Nation will not take up sword against nation, nor will they learn war anymore” (Isaiah 2:4 and Micah 4:3-5). “All the nations may walk in the name of their gods” . . ..
“In the name of their gods”! The prophet did not care what way different nations followed their gods or their version of God, no matter if they called in the name of Jesus or in the name of Allah or Ahura Mazda. So shall we all walk one day, all peoples, each in its own path, but together.